The need for renewable energy, energy efficiency and energy harvesting is motivating the discovery of new materials and the design of novel devices and systems. At the 2011 MRS Spring Meeting, in San Francisco, California, April 25–29, Symposium E, 'Energy Harvesting - Recent Advances in Materials, Devices and Applications', addressed energy harvesting and, in particular, emphasized the fact that nano-structured materials are becoming increasingly attractive for such applications. This MRS symposium represents the third in a series, including those held in Spring 2008 and Fall 2009. The present proceedings volume captures 25 papers out of more than 100 presentations made during the Spring 2011 symposium. 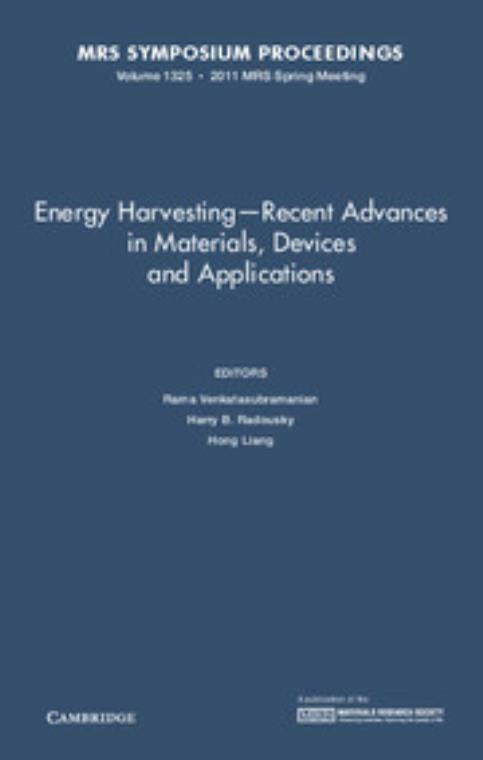 It emphasizes the importance of considering energy harvesting as a cross-cutting and multi-disciplinary activity and addresses the importance of each of the sub-fields in understanding and incorporating advances across the field as a whole. 25. The use of ammonium carbamate as a high energy density thermal energy storage material Douglas Dudis. Harry B. Radousky Lawrence Livermore National Laboratory, California. Hong Liang Texas A & M University.